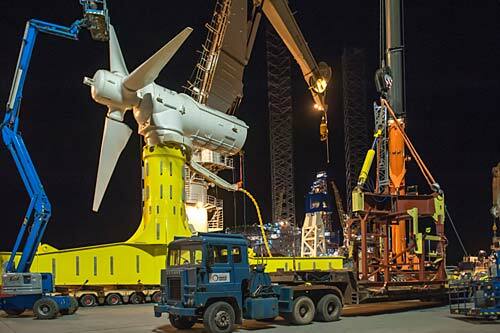 Atlantis Resources Limited has deployed the first AR1500 tidal energy turbine with new Lockheed Martin technology off the coast of Scotland. The installation is the latest development in the MeyGen project designed to harness the motion of the tides to provide clean, sustainable, predictable power for up to 175,000 homes in Scotland. Under contract and in partnership with Atlantis, Lockheed Martin designed the 1.5 megawatt AR1500 turbine. In addition to system design, Lockheed Martin developed, manufactured and delivered two innovative subsystems, the Yaw Drive System (YDS) and the Variable Pitch System (VPS). The two elements enable the turbine to rotate autonomously around its base, so it always faces into the tidal flow. The pitch angle of the turbine blades also adjusts to optimise the power generation in a given tidal stream. Installation and connection of the AR1500 was completed with record-breaking efficiency in less than 60 minutes, representing a significant time reduction compared to most similar systems. The operation marks the first time a tidal turbine has been installed and connected to the shore instantaneously. Tidal energy is produced by the surge of ocean water during the rise and fall of tides. Submerged rotors harness the power of the ocean currents to drive generators, which in turn produce electricity. The MeyGen project is currently the largest planned tidal energy project in the world. The site, in the Pentland Firth, just 2 kilometres from Scotland’s northeast tip, covers some of the fastest flowing waters in the United Kingdom. Atlantis has a goal to deploy nearly 270 turbines to generate about 400 MW of energy, enough to power 175,000 homes.